iTerm2 is a full featured terminal emulation program written for OS X using Cocoa. 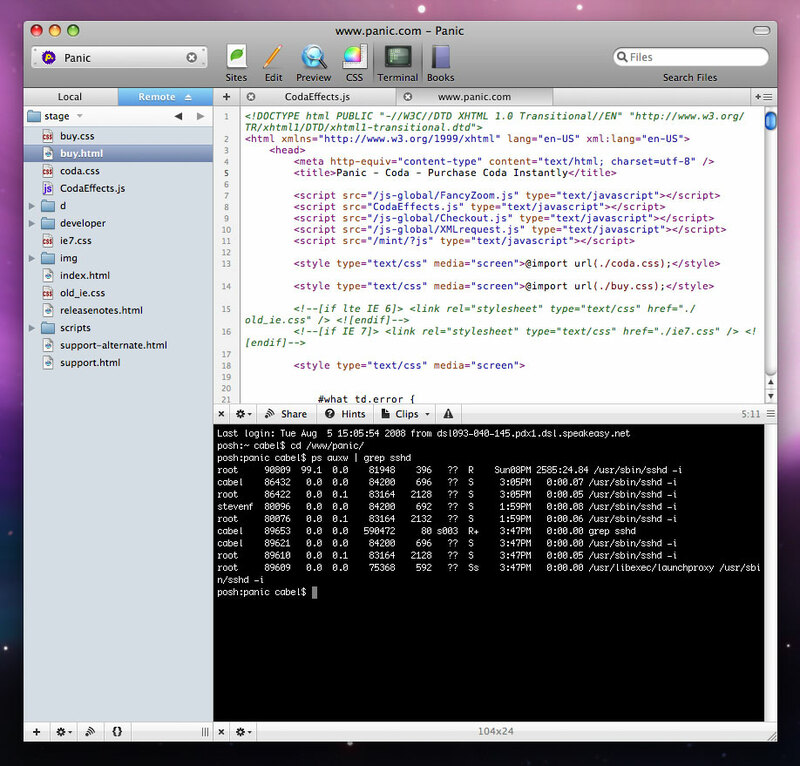 We are aiming at providing users with best command line experience under OS X. The letter i represents a native apple look and feel of the program interface, and an emphasis on complete international support. Note: iTerm2 is based on the old iTerm and is supported by the original author. 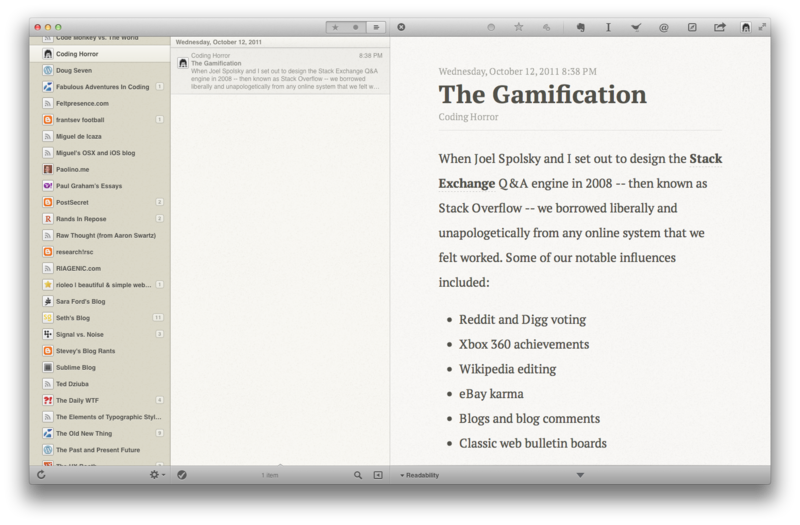 A gorgeous RSS reader based on the iOS app. Sequel Pro gives you direct access to your MySQL databases on local and remote servers. Whether you are a Mac Web Developer, Programmer or Software Developer your workflow will be streamlined with a native Mac OS X application! Task management tool with an that UI strikes a nice balance between simplicity and functionality. Can be synced with iPhone and iPad versions. It's a commercial app, and not even very cheap (40€ / $53 currently), but I've come to rely on it a lot. Take your Magic Mouse and add some more magic to it. Lets you do tons more gestures than OS X alone. Works for the new trackpad and the multitouch trackpads in laptops too. It's still a bit buggy, but really, really cool. -- TeXLive distribution and assorted goodies for the Mac. 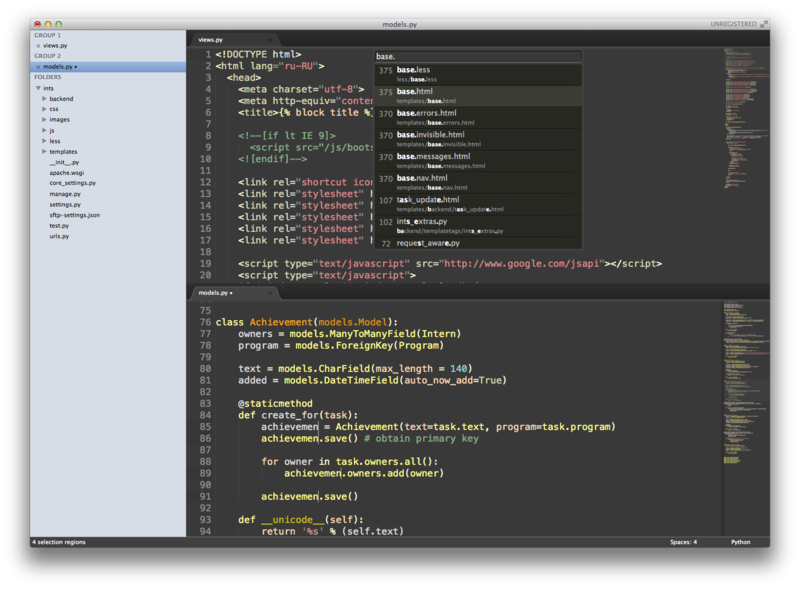 Sublime Text has grown to become my favorite GUI code editor. It feels like a spiritual successor to TextMate (even allowing support for some TextMate bundles like snippets and themes), and has many original+natural features like fully independent text cursors, a very nice search feature, and a rapidly-growing plugin API and surrounding community. I liked it so much I wrote an inline lint plugin. Never seen all these features in just one application! LaunchBar is a smart and powerful, keyboard driven productivity utility that lets you access and control every aspect of your digital life. Whatever you want to get done on your Mac – with LaunchBar it’s only a few keystrokes away. Indespensible as a keyboard utility to launch applications, open websites, search the web and a million other things. What a fantastic little App... it makes easy to share allmost any file instantly and when you create a screenshot it automatically uploads it to the web and you have the short URL ready to be pasted anywhere. TextWrangler is the (free) powerful general purpose text editor, and Unix and server administrator’s tool. It is a powerful and richly featured tool for composing, modifying, and transforming text stored in plain-text files. Among other things, it can open files from (and save them) to remote FTP and SFTP servers, offers a powerful grep engine, supports multi-byte and non-Roman text files, can perform Find Differences on pairs of files or folders, and can be invoked from the Unix command line. I absolutely hate this app, but at the same time I (or rather my iPods) cannot live without it. Please, Steve, make iTunes optional for iPods and iPads. 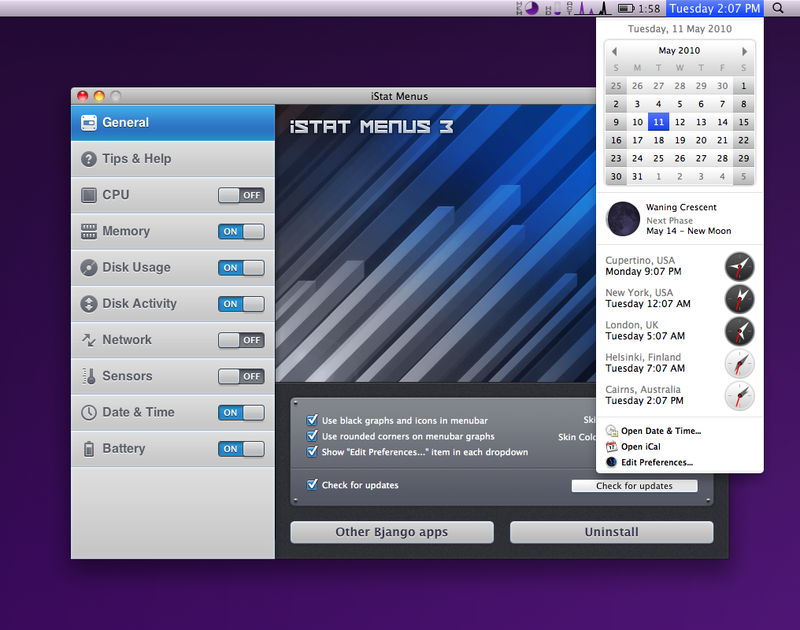 Displays customizable system monitoring information like CPU, memory and network usage and hardware temperatures in the menu bar. So like MenuMeters but a bit nicer in my opinion. Sparrow's hallmark is a simplified user interface reminiscent of Twitter clients such as Tweetie or iOS apps, as opposed to a more traditional e-mail style such as Apple's Mail or Mozilla Thunderbird. Sparrow currently supports all IMAP email accounts. It also includes features such as drag-and-drop attachments, Growl support, and keyboard shortcuts, as well as threaded replies and easy switching between Gmail accounts. is an application that stores and retrieves notes. It is an attempt to loosen the mental blockages to recording information and to scrape away the tartar of convention that handicaps its retrieval. The solution is by nature nonconformist. Hands down the best plain-text editor I've ever used. Office for Mac 2011 is the best option for Mac users who share documents at home, work, or at school. It comes packed with powerful features for creating artful documents, dynamic spreadsheets, and effective presentations. Plus it’s compatible. You can be confident that your documents will open correctly on Mac or PC. Gives almost(!) seamless Windows OS and apps integration. CCC 3 features an interface designed to make the cloning and backup procedure very intuitive. In addition to general backup, CCC can also clone one hard drive to another, copying every single block or file to create an exact replica of your source hard drive. CCC's block-level copy offers the absolute fastest performance and highest fidelity in the industry! For listening to music off the internet. This definitely has become one of the pieces of software I would first install (on a Mac or any other computer). Australia, Austria, Belgium, Denmark, Finland, France, Germany, the Netherlands, New Zealand, Norway, Spain, Sweden, Switzerland, the United Kingdom, and the United States. The Wikipedia article has details. I have Photoshop, but Acorn is an amazing, lightweight and cheap alternative I go to way, way more often. OmniFocus is designed to quickly capture your thoughts and allow you to store, manage, and process them into actionable to-do items. Perfect for the Getting Things Done® system, but flexible enough for any task management style, OmniFocus helps you work smarter by giving you powerful tools for staying on top of all the things you need to do. One of the best light weight BitTorrent clients. "A system-wide terminal on a hot-key." I press ctrl-T (the hot key I chose), and a tab-able terminal window slides down from the top of my screen. This invaluable for anyone who, like me, is constantly between the terminal and other apps. This great little tool was originally by Blacktree, who made Quicksilver. Control iTunes. Hover the mouse over the iTunes dock item to view information about the current song, You can pause or skip songs and even adjust volume just by scrolling on the itunes icon. DaisyDisk scans your disks and presents their content as interactive maps where you can easily spot unusually large files and remove them to get more free space. The map gives you an overview of your data, so you always know what your hard disks are filled with.